I made this to be used as an animated slideshow siggy. The cat silhouette came from http://www.montispixelplayground.com/. 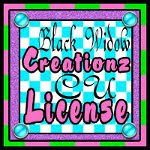 The finished animated siggy with my furbabies pics in it will be posted next!